Price inelastic – a change in price causes a smaller % change in demand. 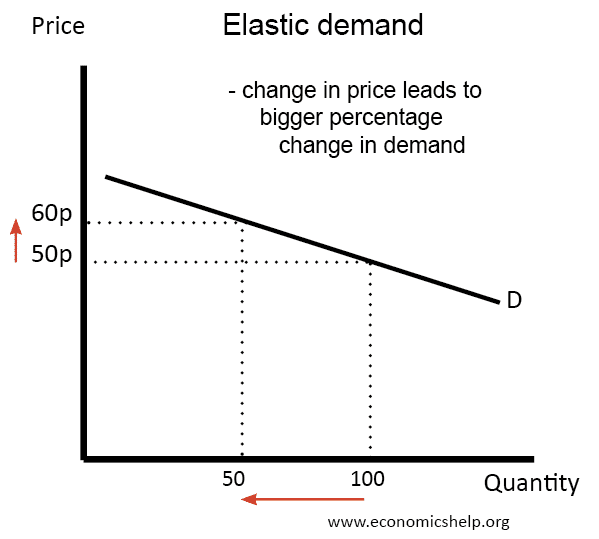 Price elastic – a change in price causes a bigger % change in demand. Petrol – petrol has few alternatives because people with a car need to buy petrol. For many driving is a necessity. There are weak substitutes, such as train, walking and the bus. But, generally, if the price of petrol goes up, demand proves very inelastic. Salt. If the price of salt increased, demand would largely be unchanged. It is only a small % of income and people tend to buy infrequently. It is a good with no real substitutes at all. A good produced by a monopoly. Any good produced by a monopoly is likely to be inelastic demand. For example, if Sky increases the cost of premiership pay per view, many football fans will pay the extra price. Though because it isn’t a necessity, demand may be less inelastic than say petrol. Tap water. For householders, tap water is a necessity with no alternatives. If the water company increase the cost of water bills, people would keep buying the service. It would have to rise to a very high price before people disconnected their water supply. This is why tap water is regulated by the government. Diamonds. Bought very infrequently, diamonds are the ultimate luxury with few exact alternatives. You could buy other precious gems, but others may not have the same allure as diamonds. A cut in price wouldn’t increase demand very much. Peak rail tickets. For commuters who rely on the train to get to work in London, demand will be very inelastic. If the price of fares from Surbiton to London increase, demand will only fall by a small amount. The alternatives for commuting into London, such as driving are limited. Cigarettes. If cigarette tax increases and the price of all tobacco increases, demand will be inelastic because many smokers are addicted and don’t have any alternatives to keep buying. Apple iPhones, iPads. The Apple brand is so strong that many consumers will pay a premium for Apple products. If the price rises for Apple iPhone, many will continue to buy. If it was a less well-known brand like Dell computers, you would expect demand to be price elastic. Heinz soup. These days there are many alternatives to Heinz soup. If price rises, people will switch to less expensive varieties. Shell petrol. We say that petrol is overall inelastic. But, if an individual petrol station increases the price, people will buy from other petrol stations. The only exception is if a petrol station has a local monopoly – e.g. at the service station on the motorway, there is a captive audience. But, in a city centre with many alternatives, people will have an elastic demand. Tesco bread. Tesco bread will be highly price elastic because there are many better alternatives. If the price of Tesco bread rises, consumers will switch to alternatives, such as Kingsmill. Daily Express. If the Daily Express increases in price, there are similar newspapers people will switch to. For example, the Daily Mail or Daily Mirror. If it was a newspaper like the Financial Times of the Economist, demand would be more inelastic, as there is no close substitute to the Financial Times. Kit Kat chocolate bar. If Kit Kats increase, people will switch to alternative types of chocolate bar. Porsche sports car. If a Porsche increases in price, demand will probably be elastic because it is a high % of income, and so the higher price will put people off. Also, there are other alternatives, such as Jaguar or Aston Martin. However, this is a little less clear cut. Some car enthusiasts may want to buy a Porsche whatever the price. 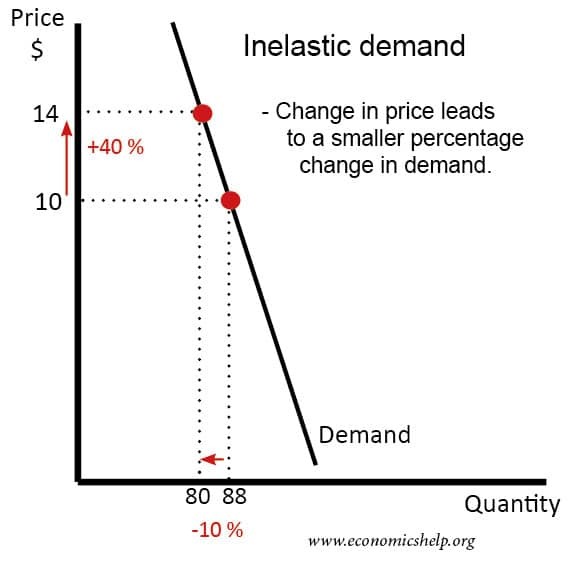 Income elasticity of demand measures how demand responds to a change in income. Income elastic – means a change in income causes a bigger % change in demand, e.g. Organic bread. If income increases people may switch to the ‘luxury’ option of organic bread. Homemade soup. If income increases, people will buy the more expensive fresh soup, rather than cheaper tins, which aren’t as nice. ‘Premium unleaded’ more expensive petrol, which is supposed to be better for your engine. Most people stick with cheapest. Fruit. If incomes increase, people may buy more bananas, but many already eat as much as they want. But, those on lower incomes may feel they can now afford to buy fresh bananas. 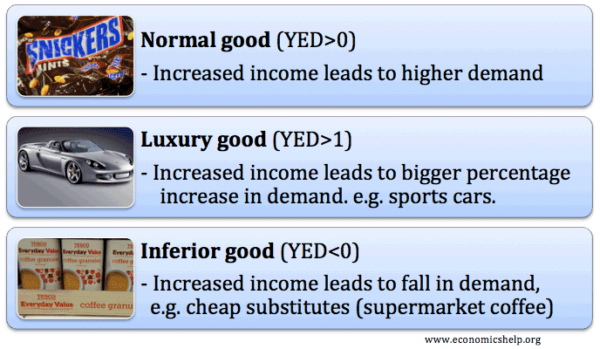 An inferior good has a negative income elasticity of demand. When incomes increase, demand falls. Tesco value baked beans. If your income increases, you stop buying Tesco value beans and switch to Heinz, which are better quality. Instant coffee. Instant coffee is cheap, if income goes up, you may buy takeaway or switch to filter coffee. Milk powder. A cheap way to drink milk. 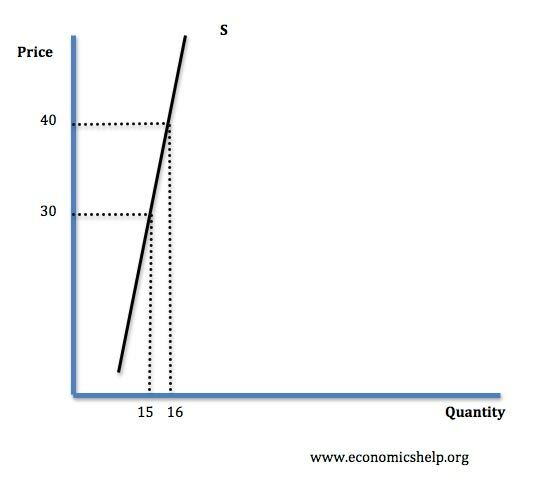 Inelastic supply means an increase in price causes a smaller % change in supply. It means firms have difficulty increasing supply in response to a rise in price. Potatoes in the short term. If the price of potatoes goes up, farmers cannot increase supply because it depends how many seeds they put in the ground in March. Nuclear Power. It would take considerable time to increase the supply of nuclear power because you need skilled labour, and it would take a long time to build. Elastic supply means an increase in price causes a bigger % change in supply. It means firms can easily increase supply in response to a change in price. Firms operating below full capacity. If a car factory is operating at 70% capacity, then it can easily increase supply and produce more cars in response to changes in price. Examples of elasticity of demand for food. This entry was posted in A-Level, economics and tagged elasticity. Bookmark the permalink. thank you so much for the information!!!! it helped me a lot in my project. Would you please give example(s) of a current, real-life Unit Elastic good or service? Thanks very much for your comprehensive explanation of this section, it will help me on my preparations for upcoming examinations before end of this current year.